As a senior graphic design major, Whitney Leach is accustomed to presenting her work to her peers and professors. “Showing a lot of the process work, having to share that with people, is something I’m pretty used to—making mock-ups and showing where your ideas come from,” she said. 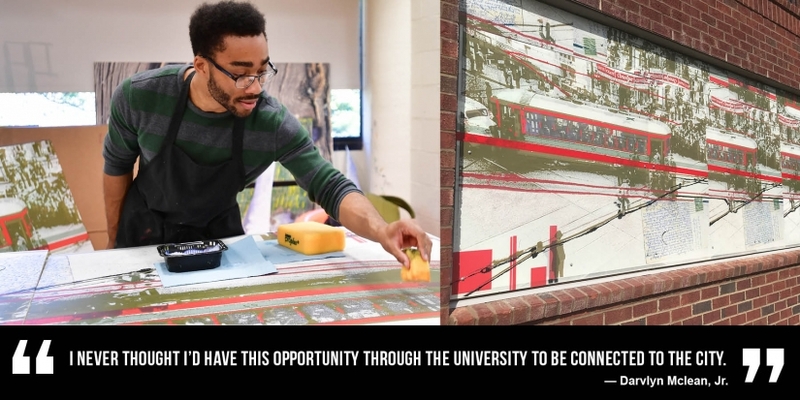 But last March, when the 15 students in the Mixed Media class at UNC Charlotte spoke about their designs for a set of public art murals, the stakes were higher than a midterm grade. The audience included representatives from Charlotte’s Public Art Commission, the Arts & Science Council, local art gallery LaCa Projects and the national developer, ArchCo Residential. ArchCo Residential had commissioned the students, led by art faculty Maja Godlewska and Erik Waterkotte, to create 10 murals for the Arlo, a new apartment building on West Morehead Street in uptown Charlotte. “This was not just a class assignment,” said Godlewska, associate professor of painting. “This is for real—a lot of people outside of class will see it.” So the pressure was on, as the students came forward to explain the images projected on a large screen in the Rowe Arts painting studio. But the students were ready: They had done their research; they had honed their skills; and they had produced work for a paying customer. “As an artist it’s all about formulating and visualizing ideas, and it’s not always going to be fully your own ideas, so having to engage with clients is a good learning experience,” said Corey Hester, a senior graphic design major. One of the dozens of new apartment buildings appearing across Charlotte’s cityscape, the Arlostands just a short distance from the heart of Wesley Heights, a community with a fascinating past and a progressive present. The century-old neighborhood was formerly a livestock farm where Charlotte’s trolley horses were fed and watered. Named a local historic district in 1994, Wesley Heights’ well-preserved homes have remained architecturally intact, and the homeowners are a diverse demographic mix. That community became the inspiration for the murals. In preparation for their designs, the students walked through the streets of Wesley Heights, sketching and photographing sights, listening to sounds and getting a feel for the physical environment. They observed the trolley and train tracks that still crisscross the landscape; they discovered old circuit blueprints inside a utility box. Leran more about the Murals that Motivate here.